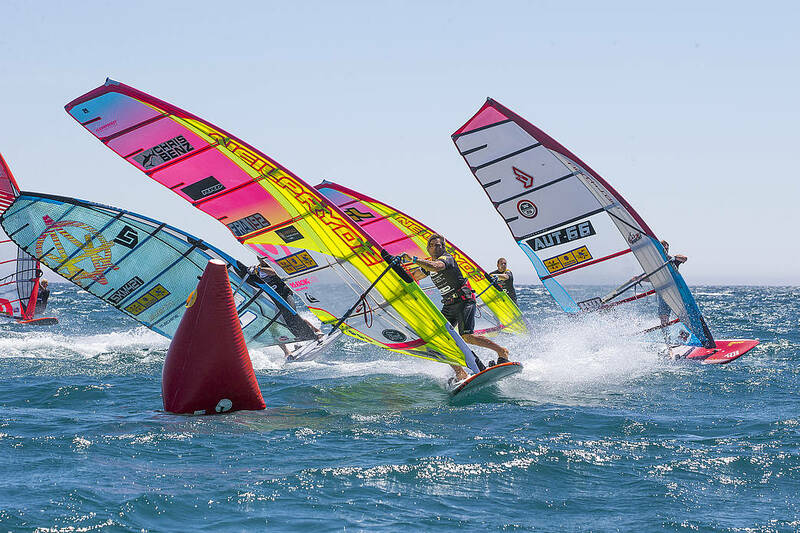 The events continue to come thick and fast for the men’s slalom fleet and after a short break after the opening two legs in Asia, the world’s fastest sailors are preparing to battle it out again over the next 6 days for the 2018 Catalunya PWA World Cup, which takes places between the 5th-10th June. The picturesque town of Sant Pere Pescador is located 150km to the north-east of Barcelona and is blessed with twelve kilometres of jaw-dropping white sand beaches and the beautiful blue waters of the Mediterranean Sea. The Gulf-de-Roses have become a world renowned destination due to its clockwork-like sea breezes, which frequently grace Costa Brava with their presence during the summer months. However, whilst offering an astonishing backdrop, the Pyrenees Mountain’s can also transform Costa Brava into a white-knuckled assault course - when the ferocious Tramontana wind whistles down the mountain range in excess of thirty knots - ready to test the mettle of any world class sailor. Matteo Iachino (Starboard / Severne / Shamal Sunglasses) returned to winning ways in Japan for the first time since 2016 after the Italian recorded 2 victories from the 4 races completed, while he has yet to finish outside the top 3 in a race this year. As a result of that victory, Iachino holds the slenderest of title race leads and he’ll look to keep himself at the top of the overall rankings by claiming his first victory in Costa Brava since 2015. Antoine Albeau (RRD / NeilPryde) is currently Iachino’s closest contender, so close in fact that they are tied on 20,200 points and AA will look to reassume control of the title race by defending his event title from last year here. With Albeau and Iachino winning one event each so far it will be interesting to see who gains the upper hand or if a different name can clinch the top spot on the podium come the end of the week. Frenchmen - Pierre Mortefon (Fanatic / NorthSails / Chopper Fins) and Pascal Toselli (JP / Loftsails / Chopper Fins) - have both made solid starts to the season, which sees them ranked 3rd and 4th respectively coming into the third event of the year and they should both be in contention again over the next 6 days. Mortefon has earned two podium finishes - 3rd in both Japan and South Korea - while Toselli has started the season with two top 6s. Apart from the top 3 - Jordy Vonk (Fanatic / NorthSails) - is the only other sailor to have qualified for every winners’ final so far this season as the young flying Dutchman enjoys his best start to a season yet. The 24-year-old just missed out on a place in the overall top 10 last year and will be eager to maintain his excellent start. Ross Williams (Tabou / GA Sails / Shamal Sunglasses) has been in contention for the top overall 3 for the last few seasons - 4th in 2015, 3rd in 2016 and 4th in 2017 - and the Brit has made another decent start to this campaign after finishing 7th and 8th in the opening two events. However, if he wants to be in the hunt for the overall podium again he may need to find a little more of the course of the week. Meanwhile, 24-year-old Tristan Algret (Starboard / Severne / Chopper Fins) followed up an excellent 4th place in Japan with another top 16 result in South Korea - 15th - which sees Algret ranked 7th after two events. Algret has performed well here over the last couple of seasons - recording two top 10 finishes and he’ll be hoping he can do the same again as he looks to break into the overall top 10 for the first time come the end of the season. Maciek Rutkowski (I-99 / Challenger Sails) comes into Costa Brava ranked 8th, but the Pole could’ve been even better off. Rutkowski was leading the final race in South Korea and looked on course to record his first bullet on the world tour, but then hit something in the water as they approached the 3rd mark. However, while that may have been disappointing the 26-year-old should be able to take away the positives as he clearly has the speed this season to mix it with the best in the world. Definitely one to keep a close eye on. Another sailor to keep an eye on will be Mateus Isaac (JP / NeilPryde) after the Brazilian enjoyed his best event yet on the world tour - winning the foiling while also finishing 4th in the slalom and if he’s anywhere near that level again he will be right in the thick of the action again. The top 10 is currently completed by Israel’s Arnon Dagan (RRD / NeilPryde) and Netherlands’ Ingmar Daldorf (Tabou / GA Sails), who will come into Costa Brava full of confidence after recording his first top 10 finish in South Korea. Elsewhere, Julien Quentel (Patrik / Avanti) is just outside the top 10 for the moment, while Malte Reuscher (Fanatic / NorthSails) and Sebastian Kördel (Starboard / GA Sails) will all be trying to force their way into the top 10 come the end of the event. Meanwhile, 19-year-old Basile Jacquin (RRD / Point-7) continues to catch the eye as one of the most exciting young talents on the tour at the moment after recording his best result yet - 11th in South Korea - and the Youth PWA Slalom World Champion will now look to continue his fine start to the year. Currently ranked 14th. You can also expect to see Cedric Bordes (Tabou / GA Sails) battling for the top 10 again after the Frenchman disappointing result in Japan with a 7th in South Korea, while Gonzalo Costa Hoevel (Starboard / Severne / Chopper Fins) and Amado Vrieswijk (JP / Severne) will be vying for places in the top 16 again. You can also expect to see Ben van der Steen (I-99 / Gun Sails), Ethan Westera (Tabou / GA Sails), Marco Lang (Fanatic / NorthSails) - who was ill in South Korea - Antoine Questel (Starboard / S2Maui) and Taty Frans (Starboard / GA Sails / Shamal Sunglasses) all bounce back. As previously mentioned Mateus Isaac won the foiling in South Korea after enjoying a fantastic final day to taste victory on the world tour for the first time and that performance there means the Brazilian is Gonzalo Costa Hoevel’s closest rival heading into the third battle of the year. Costa Hoevel has been in devastating form on the foil with an emphatic victory in Japan and a second place in South Korea, which could have easily been another victory if not for the seaweed scuppering those chances, and he’s the man that everyone else has to beat. Antoine Albeau is currently 3rd after finishing 5th in South Korea. AA was actually leading the event heading into the final race, but after hitting a piece of rope he saw his event title hopes slip away on that occasion. Albeau won the foiling here last year and will be right up there again. Elsewhere, Alexandre Cousin (Patrik / GA Sails / Chopper Fins) is not far behind in 4th after finishing 5th in Japan, before earning a place on the podium in South Korea, which gives him some breathing room over Julien Bontemps (JP / NeilPryde) and Amado Vrieswijk (JP / Severne). As the last event in South Korea showed, foiling is currently ultra competitive with 4 different winners from the 4 races complete in Ulsan and it will be interesting to see how the latest round of foiling plays out. The stage is now set for the third battle of the season and you can stay up to date with all the latest developments from Costa Brava — including elimination ladders, entry list, images and live ticker simply click HERE and scroll to the bottom of the page.